Pre-Employment Survey for basic work related values. The PROFILES STEP ONE SURVEY® II Canadian is a brief pre-employment assessment that measures an individual's basic work-related values. Work-related values that we closely examine in our Step One Survey II® Canadian include: employee background, employment history, integrity, personal reliability, and work ethic. Our PROFILES STEP ONE SURVEY® II Canadian is a brief pre-hire assessment that measures an individual’s basic work-related values. It is used primarily as a screening tool early in the candidate selection process. This assessment provides valid insight into an applicant’s work ethic, reliability, integrity, and attitudes toward theft —including property, data and timely as a screening tool early in the candidate selection process. 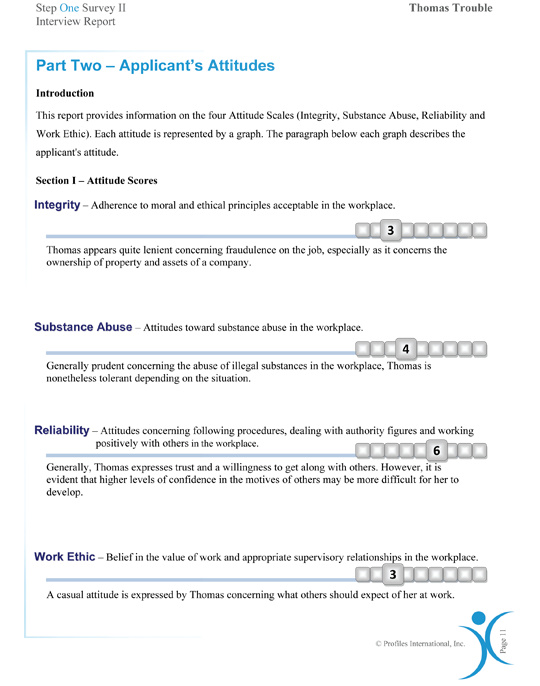 Provides a score based on the applicant's responses to questions about integrity, reliability, and work ethic.